Today after lunch with mamma, I reminded her that yesterday was Martedi’ grasso (Shrove Tuesday) which marks the end of Carnevale and the start of Lent. A traditional sweet to have at this time is either frittole or crostoli. It was a long time since I had eaten frittole, so I suggested that I help her make some. I could also take them to my father (who is currently in hospital). A quick search through the pantry confirmed that we had all the ingredients we needed so we could make them right away. Actually, she made them and I wrote down the recipe. In true Italian style, there was a lot of handfuls of this and a bit more of that, but I managed to get it written down I think! If you have not heard of frittole, they are also called frittelle and are sweet balls of goodness made with grated apple, pine nuts, sultanas soaked in grappa and orange peel. 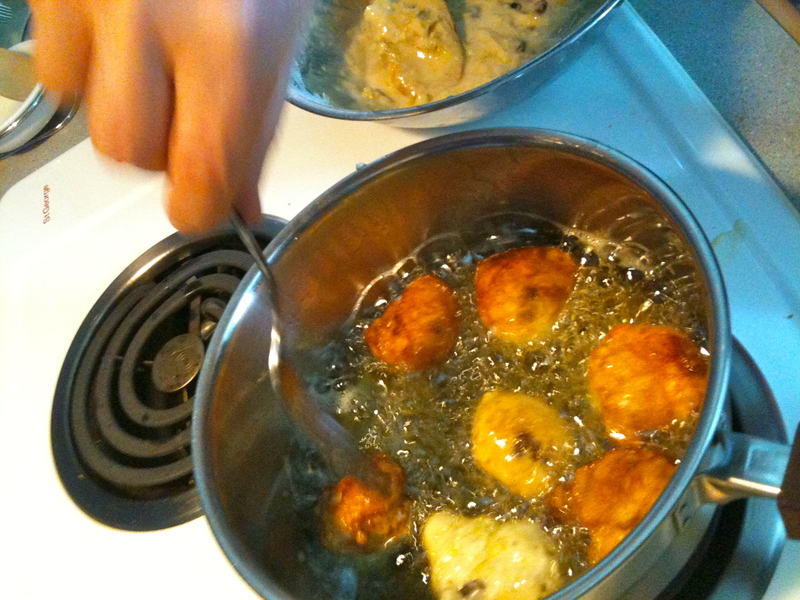 They are deep fried very quickly so that they don’t absorb much oil. They are eaten warm. In fact I ate 6 of them before she had finished cooking today! You can decorate them with icing sugar just before eating them but I like them plain as it means you don’t get icing sugar all over your face! Mamma says she made up the recipe, however it is based on what she remembers her mother and aunts made in Veneto. I took a few photos with my iPhone whilst she was making them; she was excited to think she might have a larger virtual audience! They turned out to be delicious and even better than I remember them to have been (I added a bit of extra grappa that the sultanas had been soaking in). I took a container of them to papa’ in hospital. My sister was visiting him at the time so we shared some frittole to celebrate the end of Carnevale. He loved them (and they taste much better than hospital food!). They were Jo thanks. I brought some home and they will be dessert tonight, so that will make it 8 frittole today! Paola, those are like little gems to me. My mother used to make them for holidays, you brought back so many wonderful memories, thank you. Any chance that you could share the recipe ? I never wrote my mothers down and yours sound just like hers with the sultans and apples.